This is what I hate about fairy tales. They’re exactly that, the good looking people are good and the ugly ones are evil.. Like seriously, what are we teaching our children? @GorillaMunch: yeah but there’s always that textbook He-Man or thundercats or whatever, episode, where no one trusts the ugly fucker at first and it turns out that the blonde haired dude turns out to be the Judas. 80’s cartoons know the score…. I don’t think it suggests that ugly is evil; rather, that evil is ugly. 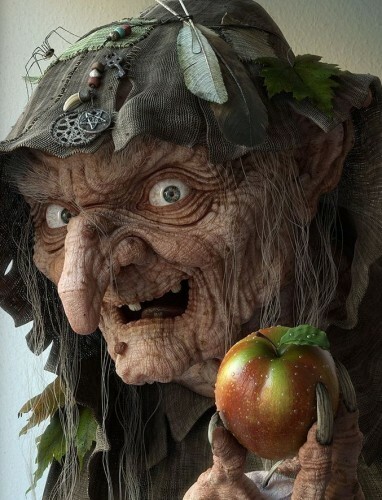 I used to watch Snow White almost every day for years so this scares the crap out of me! @Dyna-Mole: Exactly what i was thinking. so kids, today we learn that beautiful people are evil people. Damned if you’re hot, & damned if you’re not. What did you make of Klingon Chancellor Gowronâ€™s forehead?